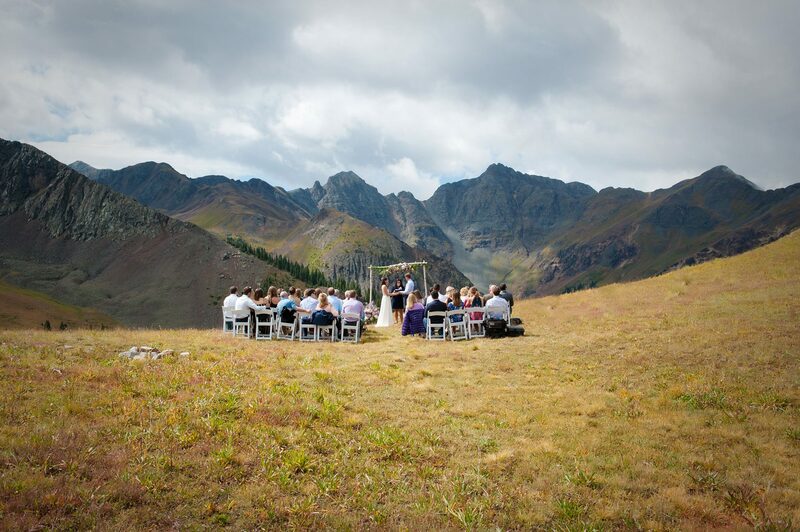 From the bride… Our inspiration for everything about our wedding is what brought us together, strengthens our relationship, and inspires our love – the mountains. We believe southwest Colorado is one of the most beautiful places in the world. We have a cabin outside of Silverton, it is our own personal base camp for most of our adventures. We got engaged while back country skiing at the top of the peak behind the cabin. It is our “happy place”, the foundation of our relationship and love. The ceremony was held in the Minnehaha basin. It isn’t the easiest place to get to, it is about 7 miles outside of Silverton and then another 2 miles up a mining road. Given the difficulty of getting to the ceremony site, we only invited family. We desperately wanted them to experience the beauty and magic of the San Juan Mountains that we get to experience every day. Getting them safely up the mountain during monsoon season was no easy feat! We chose a morning ceremony to avoid the afternoon mountain monsoons. The mountains had other plans and there were significant monsoons all morning. We started feeling defeated thinking we may not get to have our family up on the mountain because of the storm and the danger of lightning. Luckily for us, bright blue skies were on the horizon. Using our satellite phone (because there’s no cell service at 11,400 feet), we texted our family to hurry up and get to the base of the mountain. Mild to Wild Rafting & Jeep Tours shuttled everyone up to the ceremony site. 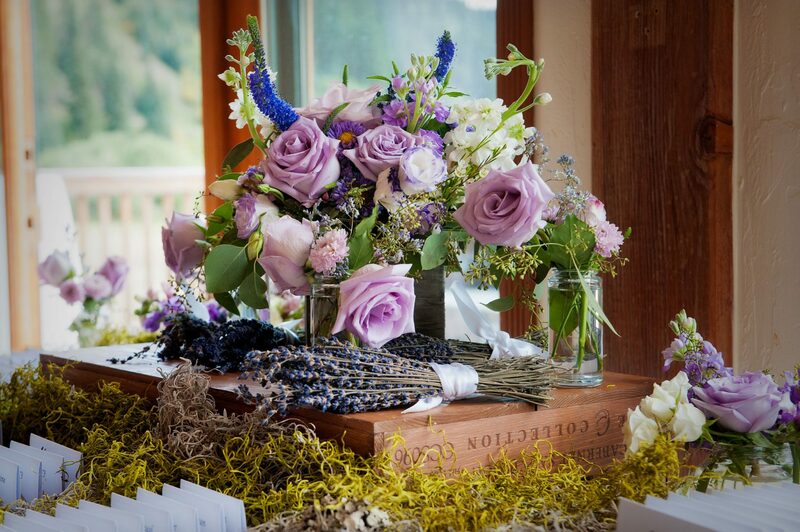 We rushed to get everything ready for the ceremony. As we were wrapping up, a thunder storm was rolling back in. We finished the ceremony in the nick of time and rushed everyone back off the mountain before another thunderstorm rolled through. 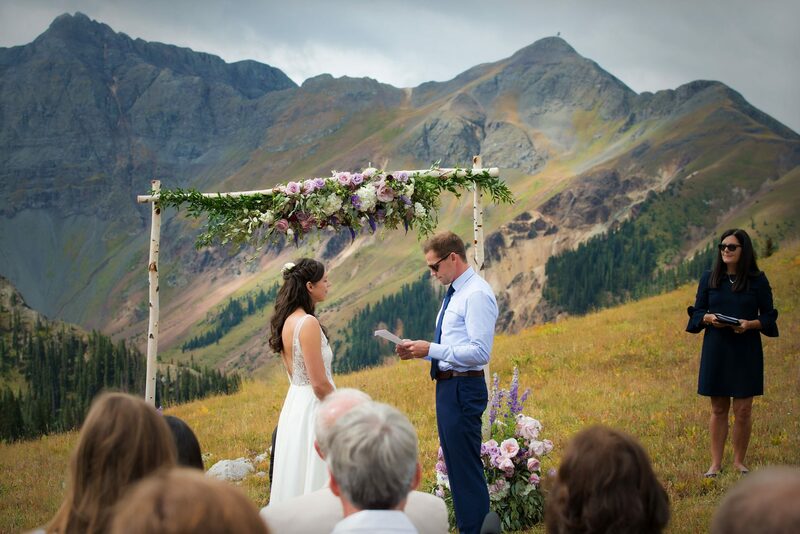 We truly found the perfect window of time to pull off our mountain ceremony. Our ceremony was the most personal part of the day. 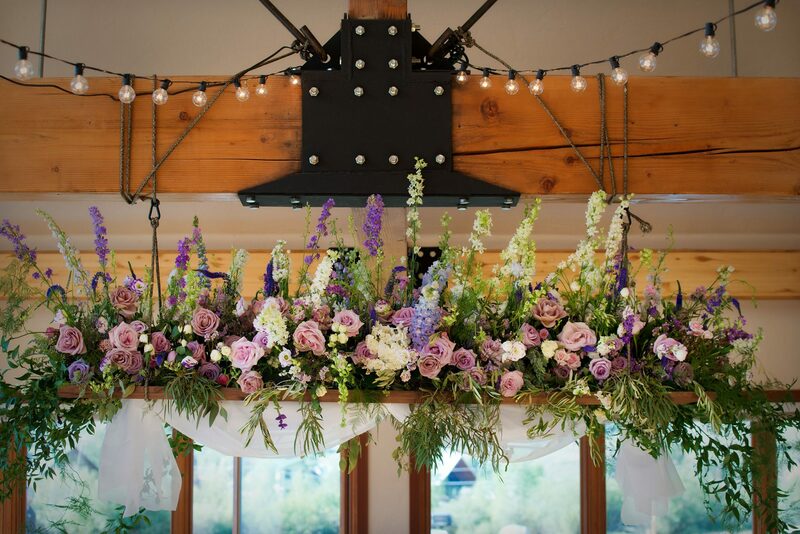 I remember always dreaming of having a ridiculous amount of flowers at my wedding. 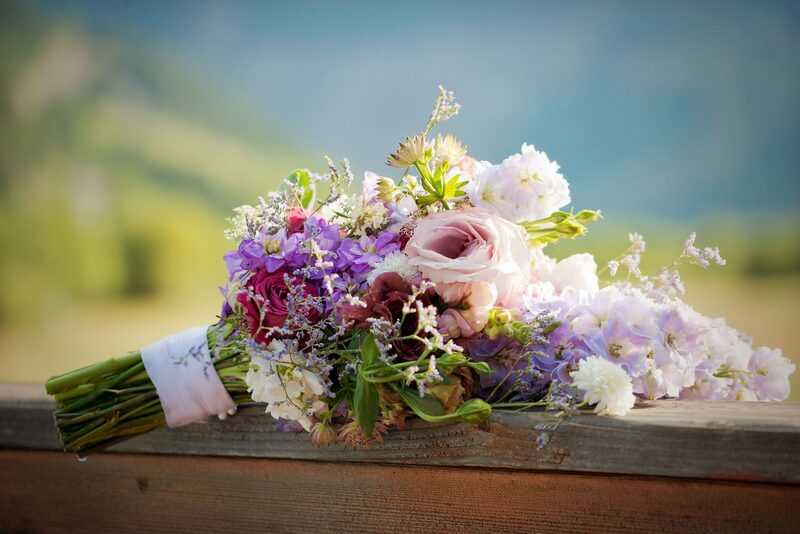 I absolutely love the wildflowers that grow in the mountains here – so the theme was to try to have my flowers look like mountain wildflowers within my color scheme. 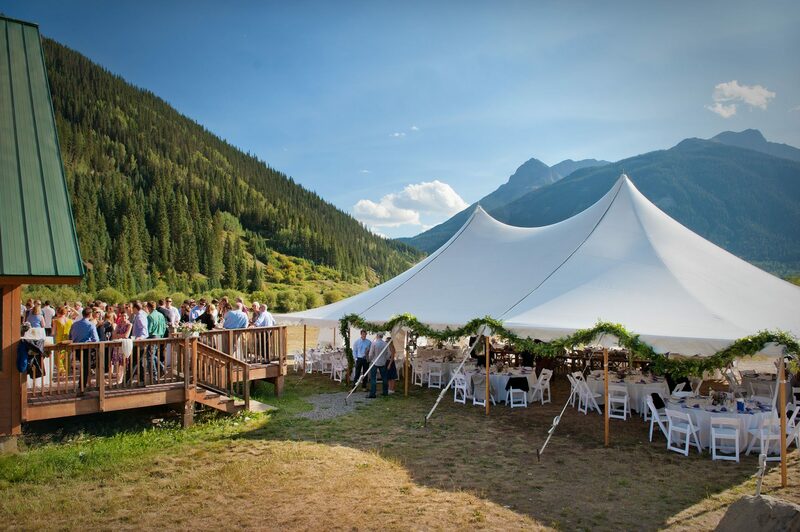 The Kendall Mountain Community Center was the perfect place to accommodate all our guests in the town of Silverton. The highlights were the dance party and our western themed photo booth – it was hilarious! I also loved the speeches and just spending time with all our friends and family. 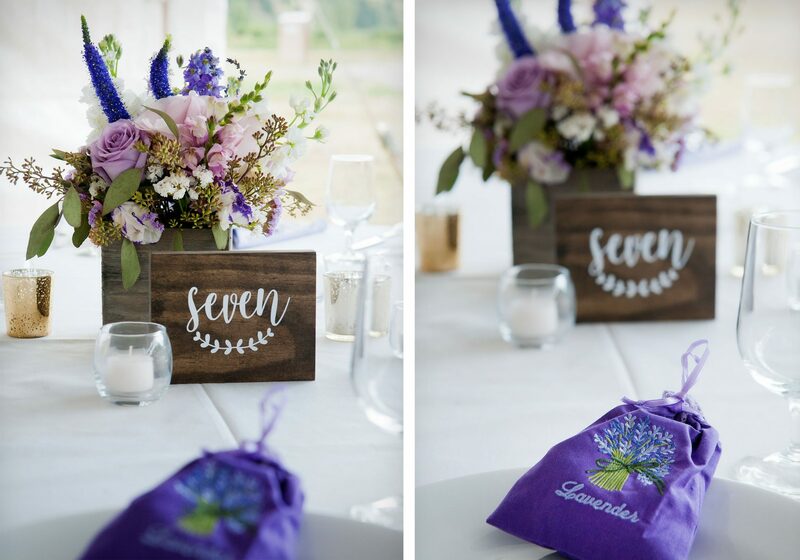 Our favor were lavender satchels all the way from Joel’s parent’s lavender farm in Pennsylvania. No matter how hard it is, remember that the day is about celebrating your love and the start of your family. While it is easy to do, don’t get wrapped up in the details. Photographer: illuminarts. Drew is absolutely amazing to work with. I knew from the beginning, that capturing the memories of the day was truly important to Drew. He wanted to know about Joel and I beforehand to ensure that we had an authentic, memorable day; it really meant a lot to me. 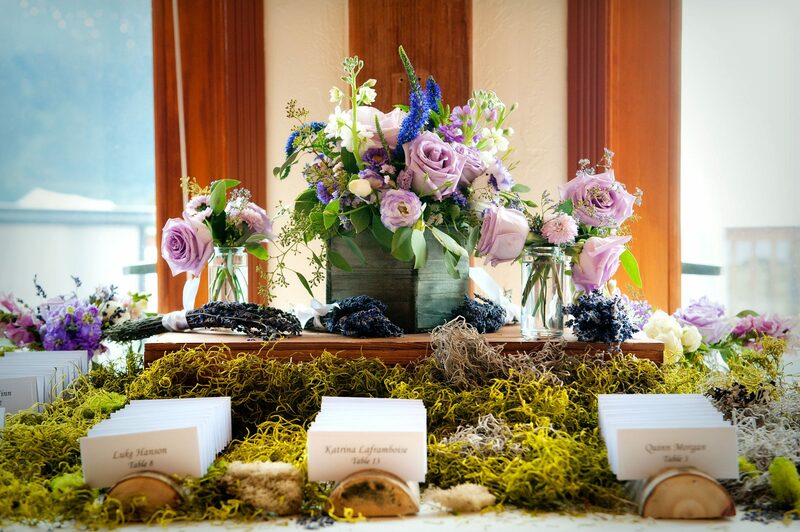 Caterer: Oh my goodness – Durangourmet all the way! Our food was OUT OF THIS WORLD. No joke, I would have ordered our food at any restaurant any day of the week. While I may be biased, I have never had such good food at a wedding before. The staff was amazing and professional as well. Can’t recommend Durangourmet enough. Rentals: Durango Party Rental. 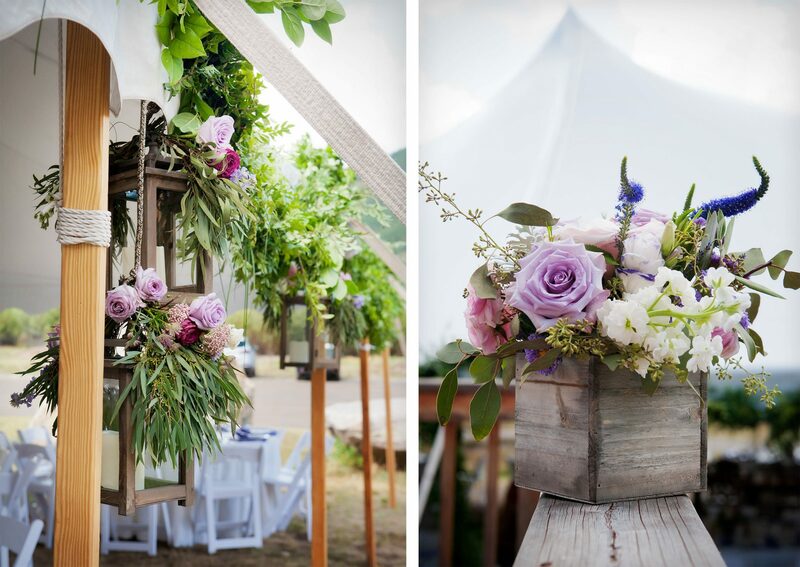 Jill Davis from Durango Party Rental is absolutely amazing. I love her. She tells it like it is. 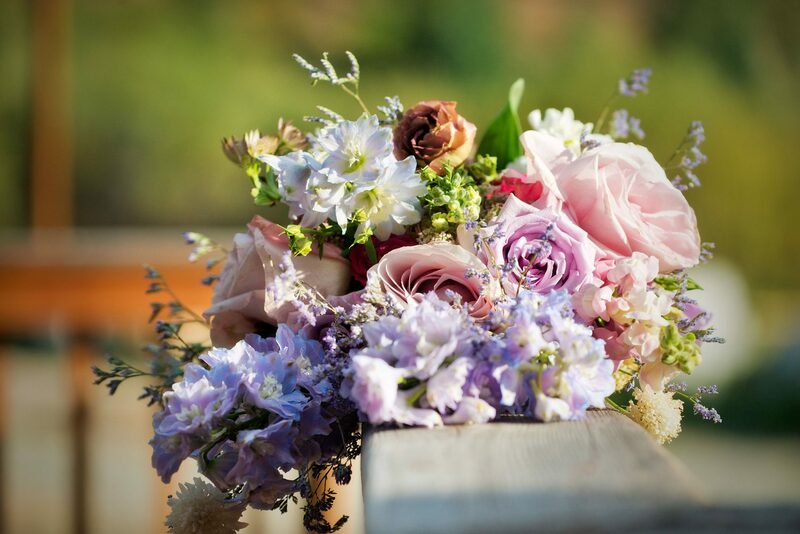 She has a wealth of knowledge and experience working with different vendors and weddings in this area. I reached out to her multiple times a week and she was always so incredibly helpful.